... alive! Though the Cuyahoga River may have caught fire not once but twice and the Indians an perennial disappointment, the people of Cleveland have not walked away. Instead, they hunkered down, doubled down, and kept hope alive. 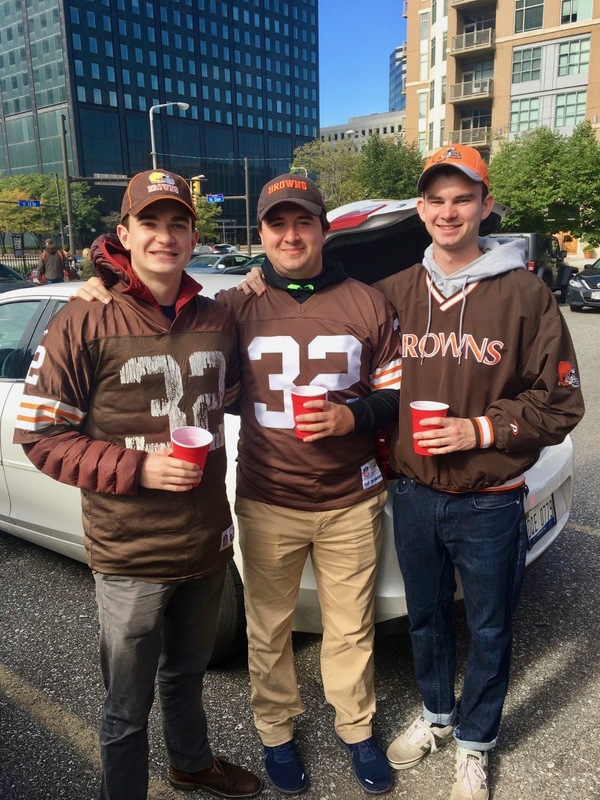 Native Clevelander, Matt Turk, Steds Junior, has recently been able to come out of his "bunker of hope" as his NFL football team, the Cleveland Browns, won a game, breaking a six hundred and thirty-five day losing streak. Yes, things seem to be turning around for city on the lake, and so, Turk decided to enlist the support of his fellow Stedsmen, John Quinlan and Brendan O'Donnell, by taking them to the recent Browns vs. L.A. Chargers game. How did it go? On keeping hope alive for Cleveland at the Browns Chargers' game, O'Donnell said, "This was my first NFL game, and after witnessing the Browns play, I'm sure any game I'll see after can only get better!"